So New York is a perfume by Bond No. 9 for women and was released in 2003. The scent is gourmand-sweet. It is still in production. 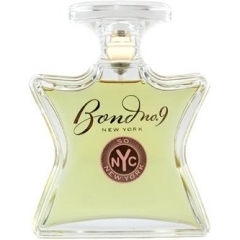 Bond no 9 SO NEW YORK is a solid composition featuring unsweetened cocoa and coffee. I've occasionally toyed with the idea of adding a bottle of this perfume to my collection, but seeing that I'm still working my way through a purse spray acquired more than two years ago, it seems safe to say that I can live without it. I do like SO NEW YORK--don't get me wrong. It reminds me in turns of Trussardi INSIDE and La Perla ECLIX. I already own both, and I don't really wear this kind of half-way-between-a-skin-scent-and-a-gourmand creation very often. It has a scrumptiousness without being overly sweet, and it also smells fairly natural. I smell much more of a bittersweet cocoa note than an expresso note, but there is also a gently sweetened creaminess, which is common to both INSIDE and ECLIX. I would definitely recommend SO NEW YORK to anyone who enjoys either or both of those perfumes, although it seems somewhat better suited to gals than to guys. I know that a lot of guys like NEW HAARLEM, but I'd advise a try-before-you-buy on this one. ECLIX has been discontinued, so this could fill the void, but I continue to see INSIDE at discounters for a fraction of this price, and I am not convinced that the quality of this particular Bond no 9 creation is any better than those two mainstream designer scents. Nonetheless, I still would not mind having a bottle of SO NEW YORK! Write the first Review for So New York!